Eight suspected cultists including the leader of Black Axe and an herbalist in the Illasamaja area of Lagos, have been arrested by Police following last week’s bloody clash between members of Black Axe and Eiye Confraternity. One of them whose dad is a politician confessed to being part of a killing mission. We saw the clip, it's quite sad. 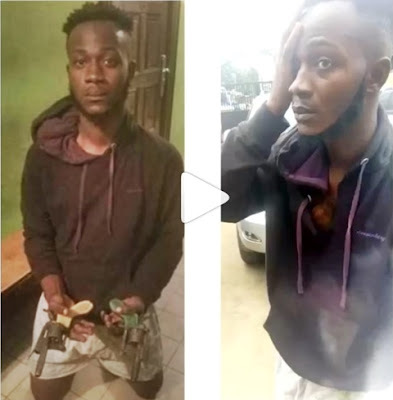 According to reports, six of the suspects - Samsudeen Musari, Senibol Pwel, Opeyemi Shoyombo, Kosoko Abiola, Joshua Oke, Adekunle Akinbola - were apprehended over the weekend at a hotel they lodged preparatory to the attack. It was gathered that policemen led by the Divisional Police Officer, Titilayo Oriyomi, a Chief Superintendent of Police (CSP), stormed the hideout and arrested the suspects who were already dressed in their regalia. While speaking to the press, a resident said the Aiye leader, Emeka Ihuoma the son of a populat politician and the herbalist identified as Adio were picked up on Monday night when the clashes resumed. Ihuoma was found with two guns and charms. He has since confessed to some killings, while the other Eiye suspect, who is a Uniosun graduate, owned up to killing four people. The resident said: “There had been serious figuring between rival cult groups in Ilasa. Some of the cultists were arrested over the weekend and two major persons on Monday.